« Always on our guard. I don’t want to frighten anyone but we are slowly sinking, or rather the Sea Level is rising around us. Combined with all this talk about unprecedented weather, namely high rainfall there are a lot of experts on Telly using a lot of jargon, apparently in parts of the UK all of the expected rain for the month of February fell in the first 4 days of the month,. One piece of jargon I heard was ‘Managed Retreat, viz, “Councils across Wales are now planning for a “managed retreat”. This is a fancy term for the fact that some coastal villages may have to be abandoned to the rising tides. Another term I heard was that of ‘Shoreline Management Plans” ( SMP), which includes actions such as, these Managed Retreats; development of Soft Defences, i.e. making beaches and dunes stable and resilient, and constructing Hard Defences, i.e. building Sea Walls, rock armoring etc. I decided to check if Northern Ireland had an SMP and it appears that no part of NI has a SMP indeed I came across a submission to the NI assembly by the National Trust dated April 2012 raising that very question. So I decided to check out what this was, hence the images associated with this post. At the peak of the last Ice 20,000 years ago most of the land of the British Isles was covered with Ice Sheets sometimes 2-3 Km thick which caused the earths crust to be pushed down into the liquidy mantle below, once the ice melted the crust rebounded quite fast initially and is slowly still doing so as the more gooey Mantle flows back into position under the crust. 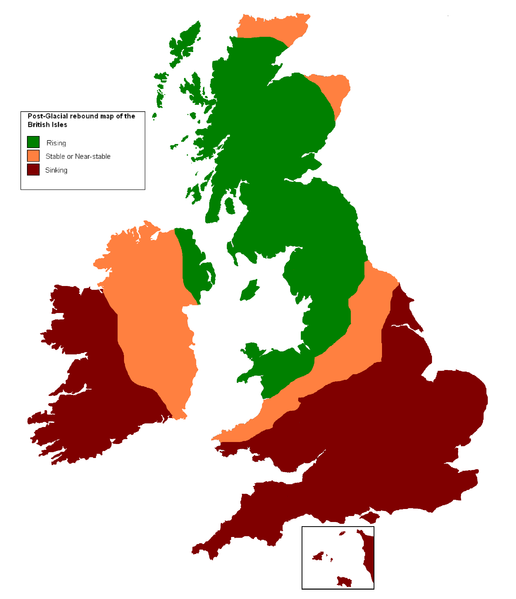 The Map of the British Isles, shows what parts are still rising; which are relatively stable and what parts are sinking. It can be seen that in them most of NI is relatively static whilst a bit in the NE, including the Mournes is rising but probably not as much as say N Scotland or Scandinavia, however the static areas and even the rising areas are not keeping apace with the rate of Sea Level Rise which has a global average of 3mm per year. Hence the statement, ‘we are not protected by Isostatic Rebound anymore’. 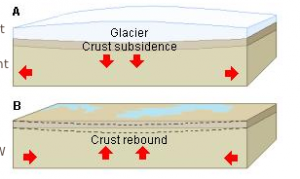 Indeed from the map it can be seen that it is worse for parts of SE and SW England as they are sinking, they were not covered by ice during the Ice Age, to now experience the rebound and worse, the flow of the mantle to the formerly depressed areas is actually causing them to sink. It is no coincidence that these are the areas that are most featured on the news as being subject to flooding. In that paper by the NI environment Link organisation it talks about problems for NI in the future caused by the rise in sea level and whilst most of the discussion is at a ‘macro’ level it does mention one village and that village is Dundrum, (again page 4, 3rd para. from bottom), it says some of the new shoreline apartments “could be gone in a matter of decades”, I guess another case of managed retreat.